These are so cute! I will definitly have to make some for my little ones, especially with fall coming up and school starting, lol. TFS! These are wonderful patterns and I just bought a bunch of purple yarn (RH) yesterday with kids' projects in mind. Thanks for making your patterns available to us...I love all your stuff! I've tried it about five times and I keep messing up :( At first I was going to just keep going, even though I'd made some errors. But my grandma's voice kept ringing in my head "Even if you have to start over and undo hours of work, START OVER!" So I started over. My husband couldn't believe it! I'm stuck ... wish I knew how to make this happen. I'd love to make this for my daughter! Join the Suzies Yarnie Stuff Yahoo Group and we will see if we can talk you through your problem. There is a link to join it near the top right hand side of the blog. how freakin' cute is that? My niece's daughter and my grand daughter will look FABULOUS in it. Thanks. I have just finished this hat,I made it in pale green with a pink trim. I'll post a photo soon. Thanks Suzie for the pattern. It is a wonderful thing you are doing. I made it for a toddler by using a smaller needle and taking out the last row to expand from 48 to 60 and one of the dc all around before getting to the change to add contrast color - it turned out cute. I used cotton yarn in denim blue and off white and it reminds me of Holly Hobby. Thanks for posting. I love the roll brim hats. I have made two already. Where would I need to increase the stitches to fit an average adult size head? Look at the list of patterns on the right hand side and there is a listing for the Roll Brim hat in adult size. just made this in one evening. Used a light green worseted with cream contrast rows and the a cream final row. used an h hook for a one year old. thank you suzie great simple hat. 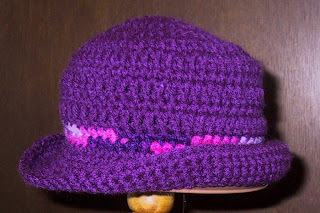 Check the links to my other patterns on the right hand side bar, there is a pattern for a larger roll brim hat there. I'm having a problem as I am make the to of the hat it doesn't stay flat and starts to curl.What am I doing wrong. It sounds like you are working to tightly, try a larger hook. It should cup slightly, not be flat. 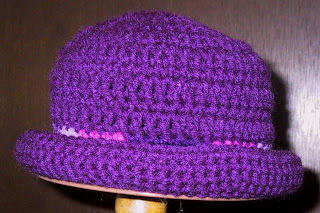 I have 2 little girls (age 2 and 4) who need hats this Christmas. How do you measure for the sizes you have? One says 20": where on the head do you take that measurement? Measure around the head above the ears. I have a very dear 7 year old friend with severe Cerebral Palsey. Her long hair is always put in two ponytails high on her head. I would like to make a hat with holes for the ponytails. (about 2" from the crown and 3" apart) Any suggestions?? When you choose a pattern pick one that starts at the crown. When you get to the round where you want the openings, chain a few stitched, and skip an equal number of stitches. On the next round, work into or over the chains. That will give you openings for the ponytails. I would measure, and make one an inch or two smaller. I was looking for a pretty hat with no seams for donations to kids' cancer groups. This is perfect. Will put crochet a flower and pin part of the brim up for the girls and do it in camo colours for the boys. Thanks SO much. I am so excited to find your pattern. I do day care and want to make hats for the kids for Christmas. This one is going to be perfect for the girls!!! I love this hat, but mine seems too small. Anyone have anyideas how to make it fit a 4 year old, bigger hook. I double checked pattern. My guess is you used one of the thinner worsted weight yarns (4). Worked with Red Heart Super Saver and the I hook it should have been plenty large enough for a 4 year old. 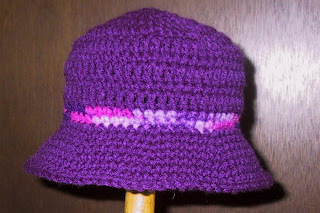 You could try making the smaller adult roll brim and with your yarn and technique it would probably turn out small enough for a child. To increase size of hat for an adult would you use a larger hook? No I would use the pattern for adults listed on the sidebar. Generally that is true, but I think dc might make the hat brim too floppy. Try it and see how you like your results. Thank you! I still plan to do the brim in SC's. Any thoughts on the sides? I appreciate your time👍🏼😊. I've done nine rows of DCs thus far with the I hook. I do feel bad about altering your wonderful pattern. If I could see my twin granddaughters I could measure and guess a bit. About all you can do is eyeball it.